You know the problem: you’ve accumulated a lot of stuff, and you’ve run out of places to keep it all. Some of it has sentimental or monetary value, so you don’t want to give it away or throw it away — what do you do with it? You could have a garage sale, or you could do what the French government did. Open a museum. They already had plenty of museums, of course, including one of the world’s largest, the Louvre. Over the centuries, though, kings named Louis and emperors named Napoleon had acquired tons of artwork, to the point that paintings and sculptures by more recent artists like Monet and Rodin were relegated to storage bins. The Louvre sent some of its “clutter” to other museums, which were already overflowing with donated artwork. 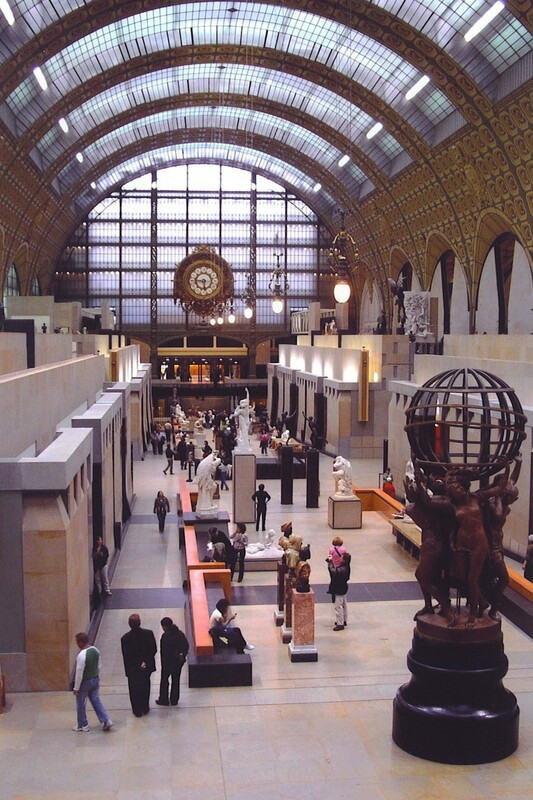 The train tracks and platforms were transformed into exhibition spaces; the Musée d’Orsay opened in 1986. It is one of my favorite art museums in the world. Among its charms is that, unlike the Louvre, it does not try to have representative works from the dawn of time until yesterday afternoon. The Orsay focuses on art work of the 19th Century, which they arbitrarily define as the period from 1848, when revolutions swept across Europe, to 1914, when World War I began. As a result, a tour of the Orsay begins with what we might call traditional art — realism — exemplified by Ingres and Delacroix. It then displays the transitional work of Manet and Daumier and Degas, to the Impressionists (Monet, Renoir), and on to Post-Impressionism (Van Gogh, Cézanne) and beyond. The Orsay also has some stuff on display that will make you say “huh?”, or even sneer. As the museum’s first director, Françoise Cachin acknowledged, “Certainly we have bad paintings. (But) We have only the greatest bad paintings.” Of course, they have some of the greatest good paintings, too. The collection includes works that have been widely reproduced: you’ve seen them on calendars, cocktail napkins, and hanging on the walls of insurance offices worldwide. Because it’s not massive — no bigger than a train station — it’s possible to see the Orsay in a few hours. At the end of your visit, you’ll still have some feeling left in your legs. And you’ll be impressed with the ingenuity the French applied to their fine-art storage problem. This entry was posted in Art, Travel and tagged Musee d'Orsay, Paris. Bookmark the permalink.